Welcome to the 2014 Gaduation ceremony. 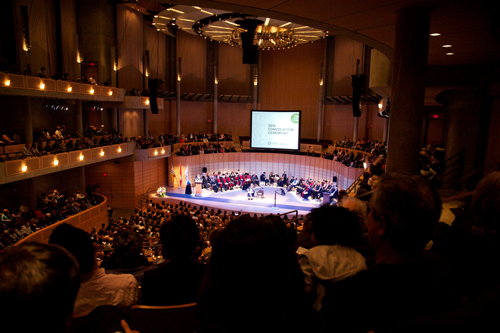 You are the seventeenth generation of students that have passed through Emily Carr since I became President in 1996. I am sure that you have discovered that we do many things differently at Emily Carr. Among the most important is that we try to encourage you to move from understanding creativity to making objects, or producing designs or creating media. To move from understanding to action. We encourage you to learn that you need theory and history in order to be original and to learn that the community we have at Emily Carr is a reflection of many other communities in the complex world that we live in and that sensitivity to community, to the radiating families we all share, to interaction with those communities is at the heart of inspiration, imagination and output. You have had the chance to breathe and take in the DNA of this university. Our DNA is steeped in innovation and change. In the 1960's we established one of the earliest programs in animation in Canada. In the late 1960's we built an intermedia program that was later copied all over the world. At that time, many of our students learned about the Fine Arts from people like Jack Shadbolt and Gordon Smith. It is not an accident that one of our most famous graduates is Douglas Coupland or that on the other side of the spectrum, that the Art Director for Vanity Fair is an Emily Carr graduate. Our grads are working at Facebook, Google, and Apple. We have won more Canadian painting competitions than any of the art and design schools in Canada. Our Filmmakers and animators regularly win awards and most recently we were honored to be designated as the 11th most important school in Design in the world. All of this doesn't happen by accident. It is the product of great teachers and great staff. It is also the result of the endless ways in which we as an institution question ourselves, question our assumptions, direction and plans. To some degree, creativity is about managing crises, the crisis of inspiration, the crisis of completion, and the crisis of creating meaningful messages, works or expressions. No disciplinary practice easily escapes its constraints or it's histories. But if creative engagement is anything it is that you discover through practices and repetition that even the most banal of situations can be transformed into something beautiful. Beauty can be squeezed out of any situation or experience. Often inspiration comes from an intense moment of self-recognition combined with a desire to make an event or an object beautiful, rich with meaning and even richer in impact. When I first set foot in this institution, I could see and feel the palpable excitement of students and faculty and staff as they witnessed and participated in the explosion of ideas that is at the heart of our lives here, being of a place and in a place that celebrates alternative ways of seeing the world. Alternative ways of seeing and experiencing the world. This too is in our DNA. You are risk takers. A piece of wood becomes a beautiful totem pole. Large swaths of fabric are turned into floating objects that respond to the movements of people as they stare in wonder at the simplicity and grandeur of an airborne sculpture. A large painting becomes a modern day expression of Reubens replete with cell phones and computers painted onto a background from many hundreds of years ago. Or the sheer wonder of a hand drawn animated film that generates movement from stillness and color from imagination. Or the translation of an idea into a 3D printed object, the transformation of computer code into action, or the magic of ceramics and photography. To think that we are a university of art and design! And, in being this unique and specialized place we are a rarity. There should be many more of us, but for you our uniqueness in Canada and in the world means that when you leave, you will find that you are wanted, that there are jobs for you, companies you can create, projects you can pursue, communities that you can build and contribute to, ideas and messages that you can generate and communicate. It would be fair to say that what awaits you is the opportunity to create your future and only you can take responsibility for that. And you must take responsibility not only for the development of your career, but also for the environment, for the creative people you know and the creative sector we share. Recently, we had a wonderful show in the concourse gallery where grafitti and abstract expressionism met each other for the first time. The colors pulsed from floor to ceiling. There was a roughness to the show and also a uniqueness that told the story of creativity bursting the boundaries of our expectations. In gazing at the space, I realized with depth and humility why it was that I had spent so many years defending and celebrating this place, your place, our place. It is because we must protect and safeguard the freedom and the right to express what we feel, what we think, what we hope for. But we must do this with the greatest respect for each other and for the communities we live in. And, it is at this small university on the edge of the Pacific Ocean surrounded by some of the most beautiful nature in the world and in a young city growing to understand its role in the world that you and all of us here have had the privilege of getting to know each other, sharing our fears and accomplishments and most of all discovering how we many want to live our lives in the midst of tumult and contradiction. Hold these years dear to your hearts as those of us who work here hope you will achieve your dreams.